Plans to transform central London with a 22-mile-long underground ring road were revealed recently. Costing £30 billion to construct, it would remove tens of thousands of cars from the crowded streets above. The Inner Orbital Tunnel would be one of the most ambitious infrastructure schemes ever seen in the city, with subterranean dual carriageways linking key routes, from the A40 Westway to the A12 in the east, and the A1 route north to the A2 running south. It would mean quieter neighbourhoods and cleaner air for millions of families living in the centre and along overcrowded arteries like the South Circular. Motorists would enjoy faster trips, with bottlenecks like the Earl’s Court one-way system given relief. Tower Bridge would be closed to all traffic except buses and bicycles, with the new tunnel creating two new crossings beneath the Thames. Boris Johnson, who commissioned work to develop the idea, believes it could dramatically improve quality of life for residents. He said: “I would love the views of Evening Standard readers on this. There are big arguments in favour. There are obviously arguments against.” Transport for London is working on the concept, which could avert traffic gridlock. It forecasts a 60 per cent surge in congestion in the central zone by 2031 if nothing is done, while outer areas would suffer increases in congestion of 15 to 25 per cent. London’s most notorious gyratory system will be transformed into an attractive high street under plans for the future of London’s roads published by the mayor today. 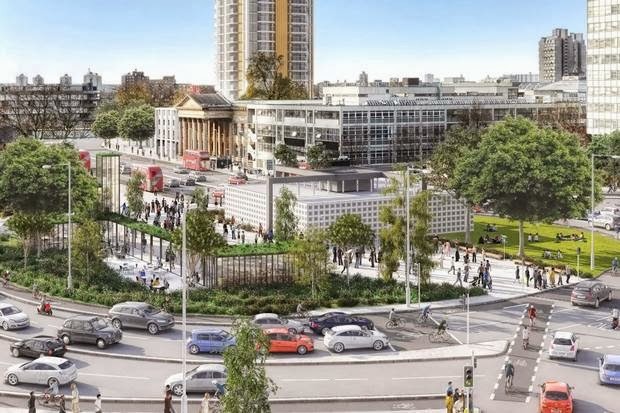 The roundabout at Elephant & Castle in south east London will become a green and more liveable “peninsula” for the area which is already earmarked for 5,000 new homes and 4,000 new jobs. With work beginning next year, the existing gyratory will be turned into a two-way road which will smooth traffic flows and reduce speeds at an accident blackspot that critics say has become a racetrack. Plans for Elephant & Castle unveiled today following a summit of the mayor’s Roads Task Force which was set up by the mayor and draws on a £4bn capital budget for the biggest improvement to London’s roads in a generation. A similar approach will be adopted the Waterloo “IMAX” roundabout and Vauxhall Cross as one of the gateways to the new Battersea Power station/Nine Elms development zone. Today also marks the completion of a major project to transform Euston Circus, one of London’s biggest and busiest road junctions, a joint project by TfL, Camden Council and developer British Land. The overhaul, which will make the junction safer for cyclists and pedestrians as well as significantly increase space for urban realm, is the first major project in the capital to be delivered using the recommendations set out by the Roads Task Force. Alongside the transformation of 33 of London’s road junctions announced last week as part of the Mayor’s cycling programme, there will also be more than £200m of additional far-reaching improvements at 17 major locations across the capital, including at; Croydon Fiveways; Balham High Road; Brent Cross; Charlie Brown’s Roundabout; Euston Road; Lombard Roundabout; London Road Roundabout; Malden Rushett; Mill Hill Circus; Purley Cross Gyratory; Barking Riverside; Seven Sisters Road; Stoke Newington Gyratory; Thornton Heath Ponds; Trinity Road; Tulse Hill Gyratory and Victoria Circus. Funding for these schemes would be covered by the TfL Business Plan and through third party contributions. Chair of Living Streets Jeremy Leach said the changes meant Elephant & Castle could now be restored as the Piccadilly Circus of south London. 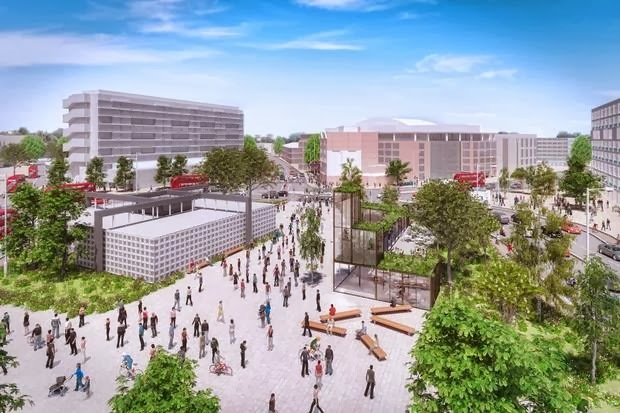 He said: "The plan to remove the northern roundabout at the Elephant & Castle is extremely welcome and will help encourage thousands more people to walk and cycle through the area every day. For 50 years pedestrians and cyclists have been intimidated by fast moving traffic which pushed them to the margins of what used to be the thriving Piccadilly Circus of the south and left them as an after thought. As well as removing the roundabout it is great that TfL is also thinking about creating a high quality place for those on foot with an emphasis on greenery and places to sit."